Having a plan in place for selling will ensure the process is faster and simpler for you and everyone involved. You can start by checking out other recent, comparable property sales in your area to help you get an estimate of the current market value of your property. You can also obtain a council ratings valuation (often referred to as called ‘rateable value’), or you can get a property value report (often referred to as ‘market value’) by paying a property valuer or asking around for quotes from a few real estate agents. Your research should help shed some light for you in regard to whether the time of year will have an impact on your sale, help you with a pricing strategy and give you an understanding on how to negotiate with buyers. 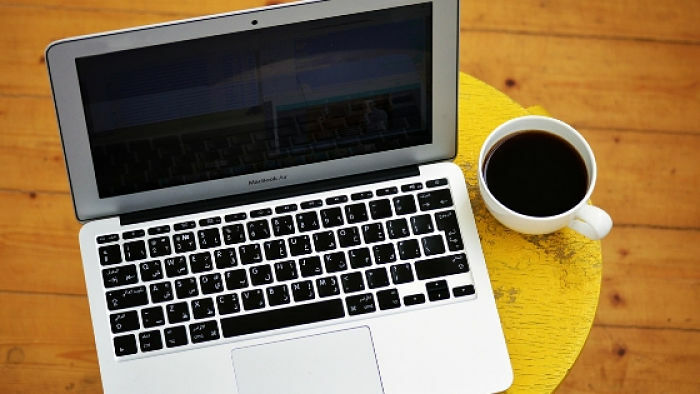 Buyers today have access to the same information online that you do, so let’s assume they have done their own research and are familiar with the local market too! Once you have an estimate of what your property is worth, you can decide on a price range for your property. Start by considering the lowest price you would happy to accept and how long you are prepared to wait for a sale. Typically, the more reasonably priced the property is, the faster it sells. One proven tactic, often used by agents, for pricing your home, is to find the three most recent house sales in your area that are most comparable with your property, find the average, then list your property for 10% less than this. This will provide you with a competitive price…not low enough for people to wonder if there is something wrong with your property but affordable enough for more buyers to put your property at the top of their viewing list! This tactic often creates interest from multiple buyers and can result in more bids, which can result in a higher sale price! Ok so you’ve done your research. Most of which was probably online and from the comfort of your own home…but now, the next trick? LITERALLY check out the competition. Find open homes in your area and see how your property stacks up against them! Are they comparable? What are they priced like? It is also a great way to get some ideas for staging your home or holding your own open home…what does the agent ask you? What are other potential buyers focusing on? What are you focusing on? Did you open the oven?? If so, you can bet potential buyers will do the same at your open home…so use this information to your advantage preparing for your own viewings. And for goodness sake…clean your oven! Not done, and these things will just put people off. You don’t want to do those niggly jobs, and neither do they, they want to move in to a fresh new home ready for them to hang their family portrait. But- you will be glad to know that you don’t have to go all out renovating the whole property. Often the spending on large renovations will not be made back in sale price, so keep it in mind that repairing and minor touch-ups are usually more cost effective! 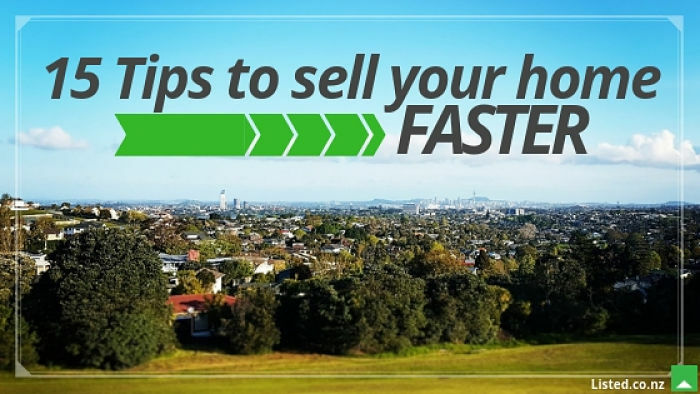 YOU WILL sell your home faster if you have “all your ducks in a row”! Get yourself ready to go, with a solicitor and all the documents and information you might need during the sale process, at your fingertips. This will ensure the viewing, sale and purchase process goes quickly and smoothly for both buyer and seller. As the property owner, you have a legal obligation to tell buyers about any issues with your property- so consider getting a building report and upload it onto your listing at listed.co.nz. Although a buyer may choose to get their own building report done by another company, having a report done and ready to view on your listing will certainly save time and money for most buyers, as well as prove you are an honest seller and not here to muck around! Have you made any improvements to your property that required building consent? If so make sure you have your code of compliance certificate from the council available. Or are there any improvements you have thought about making to your property but have decided you don’t have time? If you’ve been granted planning permission, upload it as this is another great selling point. All these documents can be uploaded ready to be viewed on your property listing at listed.co.nz! Its also going to make things faster if you make sure you have your finances in order…Do you need to contact your mortgage lender or bank to let them know you are selling? Are you looking to buy somewhere else? Will you need bridging finance or to remortgage? Do you have a solicitor ready to draft the purchase and sale agreement? All of things will speed up the process for both the seller and buyer. Clutter will make rooms appear darker and smaller and will suggest to buyers that the home is lacking in storage. This is NOT ideal, as storage is a huge selling point! So tidy up mess, find homes for things, put spare furniture in storage, and cull from countertops, benchtops and inside your pantry and cabinet drawers too! Clear benchtops also give the illusion of space and cleanliness…chances are, with less clutter, they are cleaner! Decluttering your home is also a great opportunity for a clear out- which will make moving much less stressful! PLEASE REMEMBER to recycle or donate what you can and dispose of what you can’t, correctly! When preparing the advertisement for your property, it’s a good idea is to decide on a target audience. Have a think about your property, and the type of people or situation it might best suit. Is it a one-bedroom bungalow near a shopping centre and a public bus route? This might be perfect to be marketed towards an older, retiring couple. Is your property four bedrooms, with a nice size backyard and local school close by? Then this would be perfect for growing family. Have a think about which scenario your house would best match and using this, you can decide what features might be important to mention or play upon, but try to remember not to make the target audience too narrow either. The fiiiiirst rule with staging…is clean! Or perhaps this is a rule of its own. It should be a no brainer. But just in case…deep clean, everything. Make sure your exterior is looking fresh! Have you heard of street appeal? At very least, sweep your paths, mow your lawns, pull weeds…etc. Burning essential oil, using a candle or air fresh plug-in or even doing some home baking…is contentious. 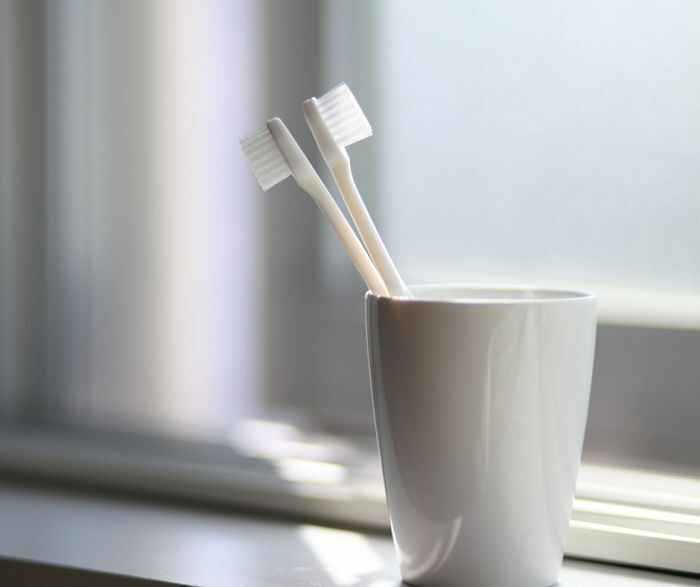 Some really like it, and others really don’t, but consider it if you want to alleviate a heavy smell in your home, perhaps from smoke or your pets. Staging can be really basic- make the beds, decorate the table with fresh flowers, fruit in the fruit bowl. Make your home feel homely, with placemats out, and fresh plush towels in the bathroom. Little details like this can make a huge difference. Cushions and throws can make beds and couches look more inviting (and cover up any little stains…). Open blinds and curtains to let light in, natural light will help rooms appear bigger. If a room seems dark, put the lights on in the room also. There is lots of information and advice out there depending on how much you want to stage your home and to what degree it would be worth it for your property. If it’s something you’re interested in and want to do it on a budget, check out pintrest! Straight up. You don’t NEED professional photography to sell your home. It is possible to research how to find the best angle and take a sweeeet photos of your property for your advertising. BUT your photos are your main advertising ploy. Most buyers will size your property up in seconds, online just by checking out your photos and consider whether to pay you a visit or not. You want your photos to make a good first impression, else it might be the only chance to make an impression you get! Professional photography is definitely worth considering for all private sales. Getting the right angle, lighting, camera lenses… can make the different from a room looking small and boring to big and breath-taking! 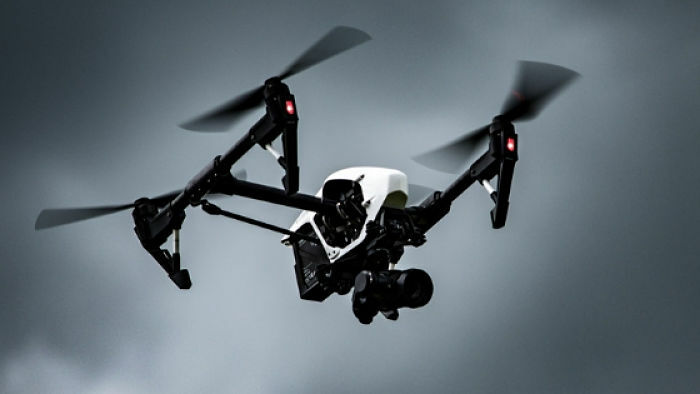 Aerial photography using drones is a fantastic way of showing off your property online to potential buyers and can provide much more than just a great aerial view! Drone footage can allow buyers to see the up-close condition of your property and its exterior, they can provide an idea of the actual location and size of your property and even a view of the surrounding neighbourhood! With the money saved on not paying commission with a private sale, professional real estate photography is definitely worth considering ensuring your property sells faster! Despite the importance of online marketing, there is still a place for a good old flyer! These are a great way to get people in the local area aware that your property is on the market. There may be lots of people looking to relocate within the area but haven’t quite got onto their online search. You can add your flyer to the property section of your local newspaper, or post flyers in local community boards, local cafes or supermarkets or your workplace. 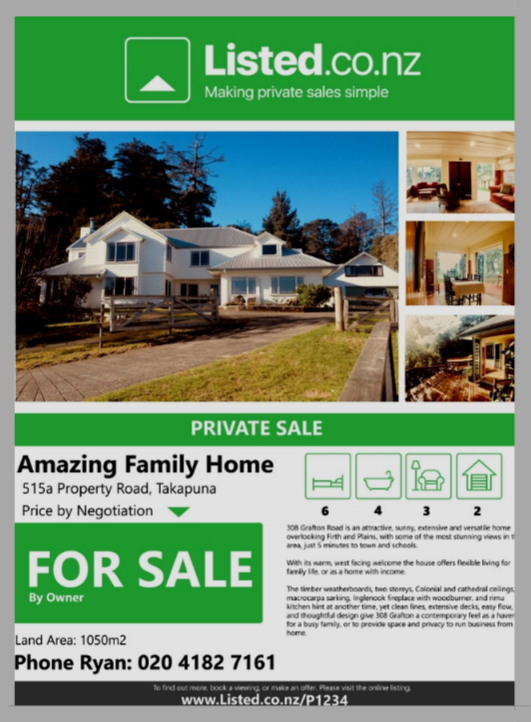 A brochure with a photo and outline of your properties features, with key details, e.g. how to contact you, is an excellent tool to hand out at viewings. Real estate agents often do this, as a reminder of the property for potential buyers to take home with them. These don’t have to be designer brochures, but they are well worth it! This people, is where it is at. Most people today will find the houses they want to view ONLINE. Gone are the days of going into your local real estate office to flick through portfolios or browse through the real estate office windows. Here is your opportunity to surprise yourself with your own marketing abilities! There are lots of opportunities to advertise your property for sale online, and I don’t mean specific real estate websites! How often do you browse Facebook and see an advert or article that catches your eye? Well, that could be your home catching the eye of a potential buyer! Even those who use real estate agents for their property sale are often doing their own social media advertising. How do I market my property online? It’s simple. 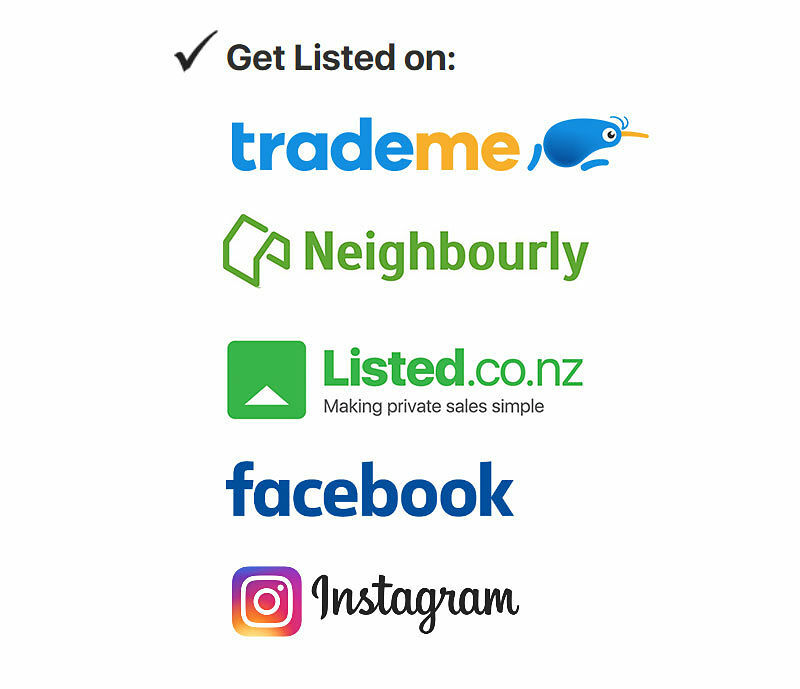 Share your Listed.co.nz listing on your Facebook page, Facebook Buy and Sell groups, (although here at Listed.co.nz we will do this for you! ), local community pages and your Instagram page. It’s also a great idea to get family and friends on board and ask them to ‘like’ and ‘share’ your listing too! One of the best ways to market your home online and to reeeeally get potential buyers to come and view your property is to create a ‘video walking tour’. For examples on how to do this, just search ‘Real Estate Walkthrough’ on YouTube. You will see how popular these are and be able to get an idea of what to include or focus on…and what to leave out! 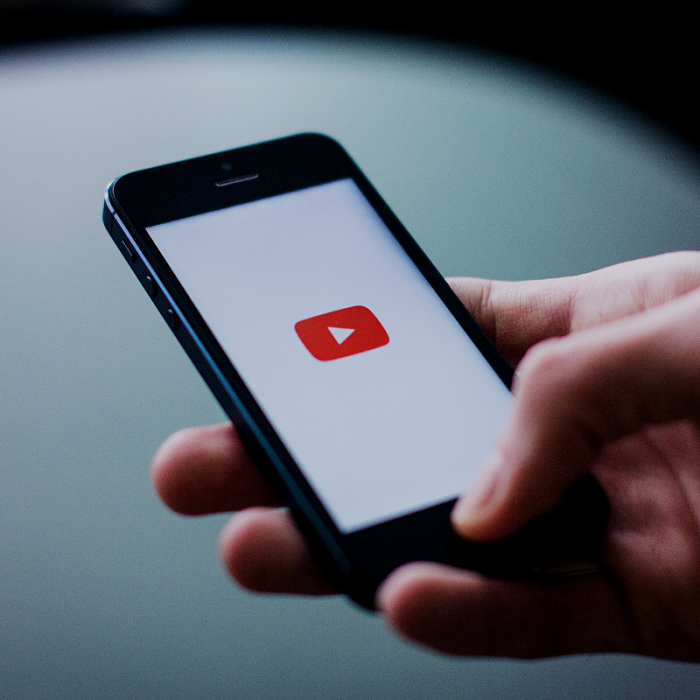 You will be able to publish your video to YouTube and then share the YouTube video to your Facebook Page and Instagram and the other pages suggested above. If you are not particularly keen on the idea of presenting a walking tour of your home, another idea is to take lots of photos of your home and present them in a video slideshow. It’s much more appealing to potential buyers to see a quick video presentation of your home, than a long blurb! Your home needs to be open for viewings…in other words, it needs to be seen to be sold! Try to be as flexible and as available as possible with your viewing options. Everyone has a different schedule and working hours and busy lives these days. The Saturday and Sunday morning ‘Open Homes’ are soooo last year! Finally, its important not to underestimate the value of the good old roadside sign advertisement. Real estate agents still use them, because they work! Everyone knows what it means to see a real estate board outside a property, so if at all they are looking for property in the area, they will know yours is up for grabs. 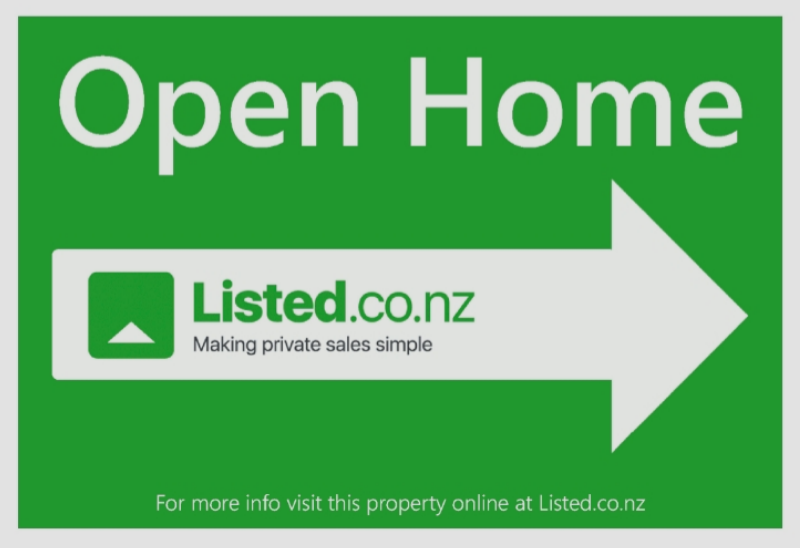 Whether people slow down for a quick read as they drive by, stop and study the info as they’re walking their dogs, or just take note of your address so they can check out your property later, a real estate roadsign is an essential piece to the private property sale process.